Type I – the behaviour conforms to its contractual specification e.g. we delivered it in the time window we said we would. 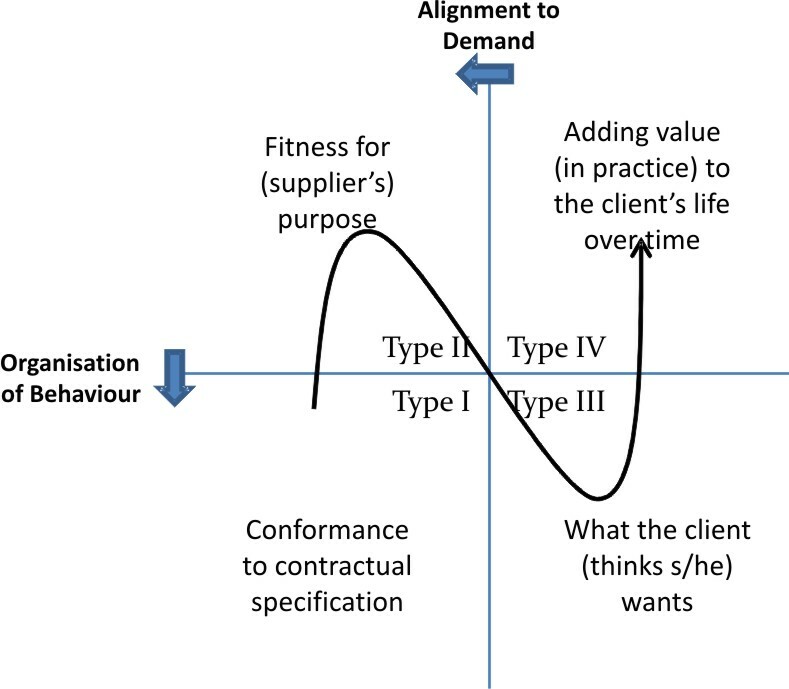 Type II – the behaviour serves the supplier’s purpose in what it delivers e.g. we delivered it in a time window that fitted the urgency you were prepared to pay for. Type III – the behaviour serves the user’s purpose in how it is delivered e.g. we installed it and ensured it was working as you expected within your environment. Type IV – the behaviour continues to serve the user’s purpose over time through being adapted to the user’s changing needs e.g. we monitored its performance and modified what it was doing as your needs changed. Using the rcKP language, the behaviours on the left are r-type and c-type, being at best customizable in ways that serve the supplier’s purpose. In contrast, the behaviours on the right are K-type and P-type, being concerned with aligning performance to the current and/or evolving nature of the user’s situation. Quality on the left can be defined largely independently of the context-of-use, while quality on the right cannot. A distinction can usefully be made between consumer, customer and client that speaks of increasing involvement with an active user’s context-of-use. The point being the lower the strategy ceiling, the fewer of the quadrants are judged to be relevant to quality, arms-length contracting restricting quality to the type I fulfillment of a contract to deliver. These definitions are implicit in the behaviour of an enterprise within the context of its domain of relevance, and reflect the way its managers’ identities are supported by those behaviours. The fourth dilemma: an ethics for the fourth estate? © 2018 Boxer Research Limited.